Located approximately 20 miles from the Tryon International Equestrian Center on the north side of Lake Lure in western North Carolina - Foxrun offers luxurious fully equipped two bedroom, two bath villas that can accommodate families and larger groups (all villas are sleep 6 private/8 maximum). In addition, all villas have a Jacuzzi and fireplace and boast either a fairway or mountain/woods view located within the gates of Rumbling Bald Resort. It is our pleasure to welcome you as our guest and wish you a pleasant stay. We value your patronage, and it is very important to us that your stay will be a comfortable and enjoyable one. We take great pride in providing our guests with the utmost in professional and personalized service. This website is provided to familiarize you with useful information about our Property as well as acquaint you with the Lake Lure area. Foxrun was developed in 1977 as a Timeshare Association located in the beautiful mountains of Lake Lure, NC. 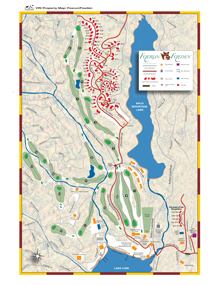 Foxrun consists of 140 two bedroom villas surrounded by 2900 acres at Rumbling Bald Resort. At this site, you will discover all about our timeshare villas, as well as our surrounding areas. Feel free to browse around this site. If you have comments or questions about our villas or area, or simply need more information and want to contact us, please call our office at 828-625-0097. Need directions to Foxrun? Click to view a Google Map. Click to view an area map of Foxrun.